Spend $30 on eligible purchases in the first 30 days after you are approved for a new Sears Mastercard® and get $20 back1 as a statement credit. Excludes deferred interest and major purchase plan purchases. Valid on new accounts opened 2/1/19 — 5/30/19, online applications only. Pile on the points. Everywhere you shop. Earn More Shop Your Way® points in more places when approved for a Sears Mastercard® card. Plus, as an automatically enrolled Shop Your Way® member, take full advantage of the online offerings outside of Sears and Kmart. Visit shopyourway.com/partners to discover hundreds of participating Shop Your Way® partners online. 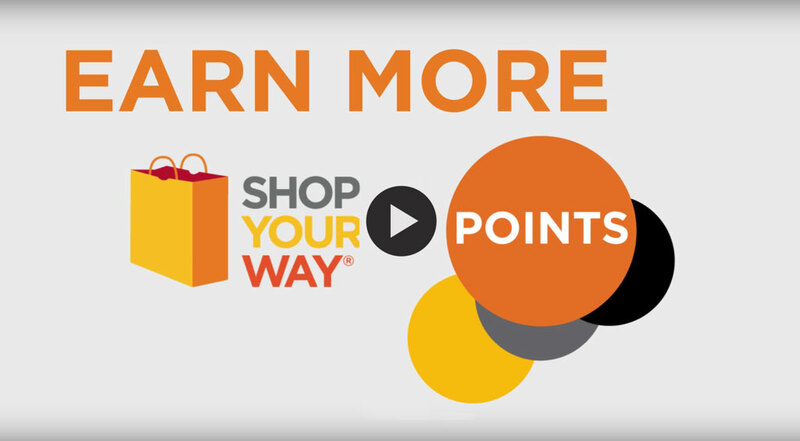 Shop Your Way® points add up for additional value. at Sears, Kmart and shopyourway.com! On select products, from home appliances and electronics to fitness equipment, tools and automotive items4 at Sears and Sears.com. 1$20 Statement Credit Offer: This offer does not apply to deferred interest or major purchase plan purchases. This promotion is only available to the applicant for use with the Sears Mastercard, is not transferable and is subject to credit approval. You have the opportunity to receive a $20 statement credit when eligible purchases totaling $30 or more are made and post to your account within 30 days of account opening. Limit one $20 credit per account. The following types of transactions don’t qualify as eligible purchases: deferred interest transactions or major purchase plan purchases; use of checks that access your Sears Card account; balance transfers; cash advances; travelers checks, foreign currency purchases, money orders, wire transfers and similar cash-like transactions; lottery tickets, gaming chips and similar betting transactions; interest and account fees; unauthorized charges; and items returned for credit. The Sears Mastercard account must be current and open at the time we determine whether you qualify for the statement credit in order to receive the statement credit. Please allow 4-8 weeks after the end of the promotional period for the statement credit to be added to your account. Limit one new account offer per account, valid for online applications only. *The Shop Your Way Additional Category Earn Program is not transferable and is subject to credit approval. The Shop Your Way Additional Category Earn Program is subject to the Shop Your Way terms and conditions located at www.shopyourway.com/terms. 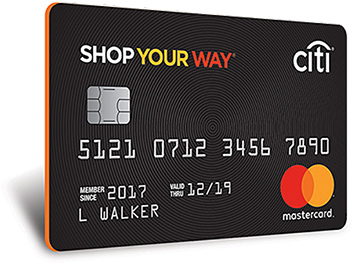 Your Shop Your Way member number must be linked to your Sears Mastercard in order to participate in the Shop Your Way Additional Category Earn Program. You have the opportunity to earn Shop Your Way points when you use your Sears Mastercard for eligible purchases. 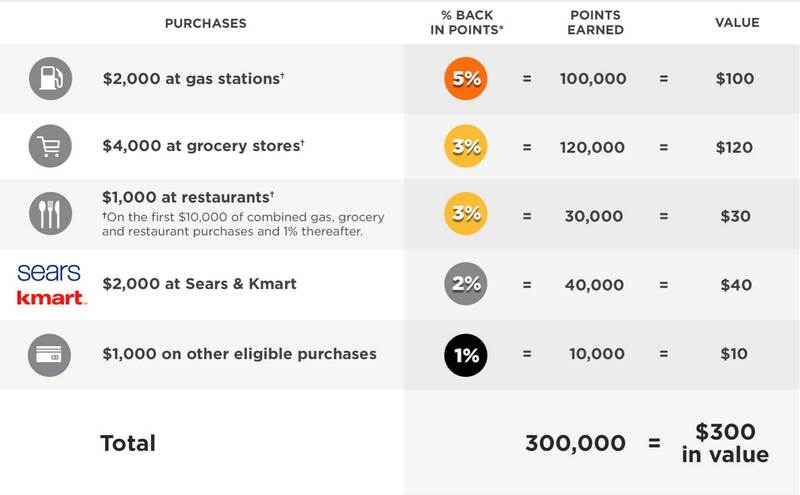 These extra points are inclusive of any base points or Sears base points earned. When extra point offers are combined, total points earned will be less than the combined point totals for each individual offer. Base points mean the 1% back in points described below. Sears base points mean those points awarded as part the standard Shop Your Way program. 4Subject to credit approval for qualifying purchases made on a qualifying Sears card at participating locations. Purchase requirements and exclusions apply. May not be combined with other offers. See store signs or associate for details, or visit sears.com/credit. Excludes Sears Commercial One® Accounts and Sears Home Improvement AccountSM valid on installed sales only. Offers are subject to change without notice. 5Mastercard Extended Warranty and Price Protection are provided by New Hampshire Insurance Company, an AIG Company. Certain conditions, restrictions and exclusions apply. Details will be provided when you receive your card.